I am so happy to share that one of my layout is featured at Scrapstreet Ezine again. FREEDOM is currently my favorite layout. I did my favorite technique on doing this layout which is hand stitching. Hope you guys will like it as much as I do. Supplies: Paper, Chipboard, Tape, Journal Block, Bling: Prima Marketing, Transparency: Hambly Screen Prints, Alphabet: Heidi Swapp, Thread: DMC, Pen: ZIG. Design Notes: To complete the layout, I doodled the swirl as a border andhand-stiched it. 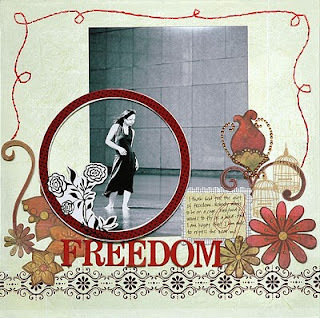 Journaling: I thank God for the gift of freedom. Nobody wants to be in a cage. Everybody wants to fly as a bird. And I am happy that I am able to express the real me.